The Lost Man trail is located in the Hunter-Fryingpan Wilderness Area of the White River National Forest east of Aspen, Colorado. 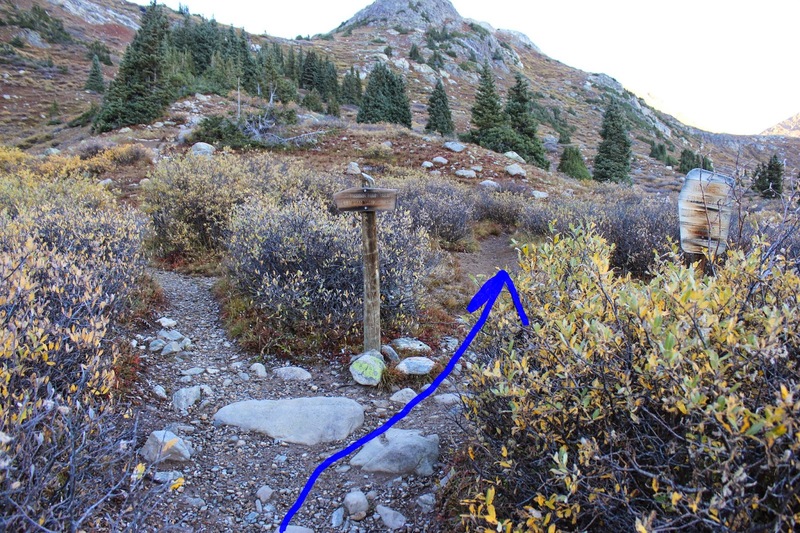 The trail forms a semi loop between its lower trailhead located near the Lost Man Campground and its upper trailhead located near the summit of Independence Pass. This post begins at the upper trailhead where it follows the trail as it climbs to its highest point above Lost Man Lake before returning along the same route. Along the way it passes by Independence Lake. 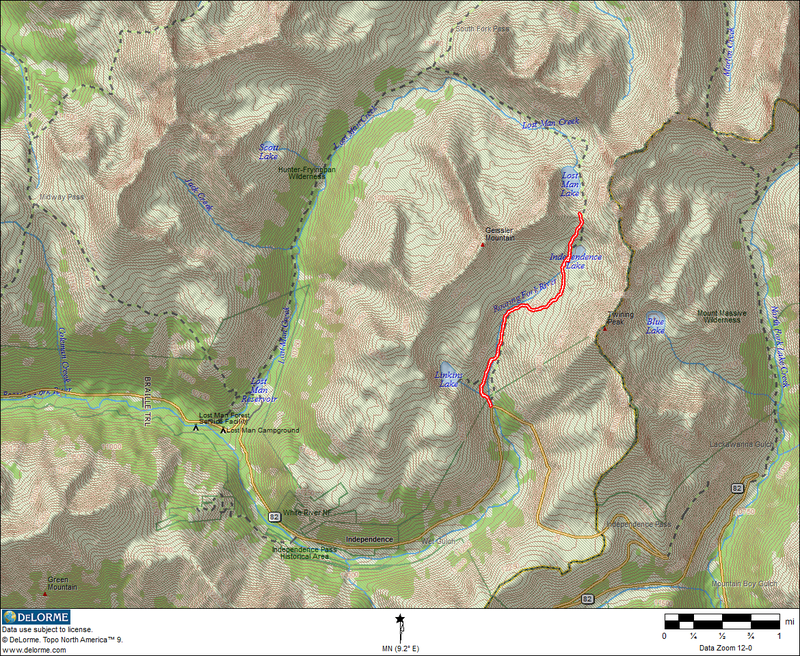 The upper trailhead is located at the last hairpin curve below the summit of Independence Pass, on the west side, about 18 miles east of Aspen. The Linkins Lake trail also begins from this trailhead. Occasionally someone will chain their bike to the trailhead kiosk so they can park at the lower trailhead, hike the entire trail from there, and then ride their bike the 4 miles back down Highway 82 to their car. The Lost Man trail departs from the Linkins trail a little over a tenth of a mile from the trailhead and immediately enters the Hunter-Fryingpan Wilderness Area. These pictures were taken on a September morning. We left the trailhead about 8 o'clock while the sun was still hidden behind Twining Peak. From here the trail parallels the Roaring Fork River for a short distance before crossing the river on a wooden bridge and continuing up the drainage along the east bank. This close to its source the river looks more like a small stream. At the 1 mile point the trail has reached an elevation of almost 12,100 feet which is about 600 feet above the trailhead. After the first mile the trail climbs away from the Roaring Fork to a higher bench. Near the 1 3/4 mile point of the hike the trail passes by Independence Lake, the source of the Roaring Fork River. We saw fish jump a couple of times and we heard the fishing is usually pretty slow. From Independence Lake the climb continues to its highest point at Lost Man Pass. Lost Man Pass is the turnaround point for this post. On this day it happened to be a good spot to watch the sun come up as the shadows slowly withdrew from Lost Man Lake. Looking south from the pass over Independence Lake the distant views are obscured by a ridge of 13,000 foot peaks. This picture taken on the return trip to the trailhead contrasts nicely with the drab photos that were taken on the hike up before the sun was over the mountain. As you can see the parking area is pretty full. There is more parking across the highway. Most of these people were hiking to Linkins Lake. The upper section of the Lost Man trail is great for those that love alpine hiking. It is a good trail for beginners if they follow a few simple guidelines. Always be prepared for cold and wet weather. Bring a layer that will keep you warm and another that will keep you dry and serve as a windbreak. Bring at least a light pair of gloves and some headgear. Other than that prepare like you would for any other hike with a map and water and the other usual stuff. The Lost Man trail can be wet and snowy all the way into July which makes waterproof hiking boots a better choice than shoes. If you would like to see it for yourself then all you have to do is 'Take a hike'.